The following mile-by-mile guide provides a class rating for each rapid. Some descriptions have land marks to look for, such as creeks entering the main stem. The descriptions for the more difficult rapids have some of the hazards to avoid and point out some of the less obstructed passages. The features of this river can change drastically at different flows. Remember, this mile-by-mile guide cannot replace the skills and judgment needed to run this Class V river. Mile 0: There is a good put-in at a gravel bar just downstream from the school in Forks of the Salmon. Mile 0-5: The river meanders through five miles of scenic open country and easy class II - III rapids. Mile 5 - Bloomer Falls (III - IV): During the 1964 flood, a landslide blocked the river at this point, backing up a lake behind the debris. When the channel was dynamited, Bloomer Falls--one of the most dangerous rapids in the state -- was created. An expert kayaker drowned here in 1982 when the big reversal at the bottom of the falls dashed him against the right-hand wall and knocked him unconscious. In August 1983 the state Department of Fish and Game dynamited the falls again -- officially, to provide a better path for Salmon swimming upstream to spawn, but probably to alleviate the danger as well. Thus a man-made Class V - VI rapid has become a man-made Class III - IV. Scout on the left. Mile 5.1 - The Maze ( IV+ ): A long, nearly continuous zig-zag through rocks and boulders deposited by a slide during the 1964 flood. Mile 6 - Lewis Creek Falls (IV+): Lewis creek enters on the left. The river turns sharply right and piles up against a rock. This is the beginning of the Salmon River Gorge. Mile 6.8 - Airplane Turn (IV+): The river turns right and drops down a channel obstructed by large boulders. Look for a runnable chute on the left. Mile 8 - Portagee Falls (III+): Portuguese Creek enters on the right. Mile 8.5 - Steelhead Falls (V): Also called Cascade. The river plunges through a boulder maze. There are several channels, but no easy ones. Scout from the left. Mile 8.7 - Cataract (IV+): Also called Achilles Heel. Another boulder-choked drop, but the passages are easier. Scout from either side. Mile 9.3 - Whirling Dervish (IV+): Just above the entrance to Grant Bluff. Mile 10 - Grant Bluff (V): Upper=Last Chance, Lower=Freight Train. A high bluff on the left bank marks the half way point where this long, difficult rapid turns sharply left. At low water you can scout from the right, run the upper section, and catch the eddy on the right, just before the left turn to scout the lower part. At higher flows it's difficult to catch the eddy and you may have to run the entire rapid without stopping. As you come around the turn, move to the left. Many boats have to squeeze through a narrow channel between two boulders at this point. You can see the rapid from a turn-out off the road atop the bluff. Mile 10.5 - Butler Creek Ledge (IV-V): Butler Creek enters on the left, and the road comes close to the river. The rapid consists of a huge river-wide hole that surfs boats into a big wrap rock just below. There is a tiny runnable slot at the far left side of the ledge. At higher flows you can miss the rapid by taking a side channel even farther left. Consider portaging if this chicken route is unavailable. Mile 10.6 - Double Hole (IV+): Two big drops just below Butler Ledge. Mile 11.1 - The Fin (IV+): Also called Fish Ladder. An eight foot drop followed by a hard left turn. The rapid can be seen from the road. Mile 11.6: Duncan Creek enters on the left. The road is close by. Mile 12.8 - Marble Rapid (IV+): Also called Gaping Maw. A fairly long, complex maze of boulders (holes at higher flows) begin just after a sharp right-hand bend. Routes depend on the water level. Scout from the left. There is a huge limestone cave on the left bank just below the rapid. Mile 13: Tom Payne Creek enters on the right. Mile 14 - Wooley Bully (III+): Wooley Creek, one of California's finest salmon streams, enters on the right. The gorge begins to open up. Class II -III rapids the rest of the way to the Klamath. Mile 15.7 - Take-out: Oak Bottom Campground (Forest Service) on the right. Many boaters take out here. Mile 16 -18.5 - Take-out: Find a spot before the road leaves the river. There is only poor river access from mile 18.5 to the confluence. 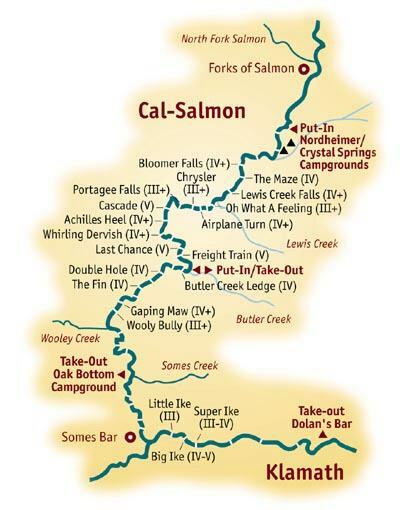 You can also float a five-mile stretch of the Klamath (the Ikes section). Mile 19: Klamath confluence. Somes Bar is on the hill between the Highway 96 bridge and the confluence.